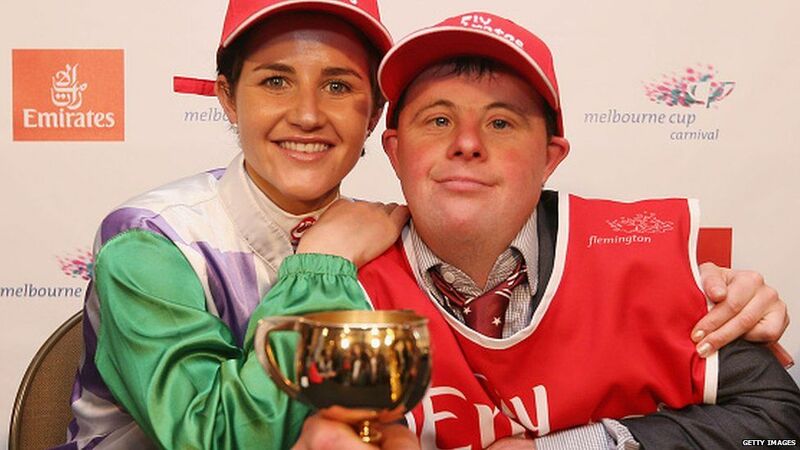 Michelle Payne became the first female jockey to win the Melbourne Cup, Australia’s most prestigious horse race. This won’t be the last article you’ll read about 30-year-old Michelle. Her horse, Prince of Penzance, was 100-1 prior to the race. Someone placed $1000 (£465) with Sportsbet and picked up $101,000 (£47,000) today. 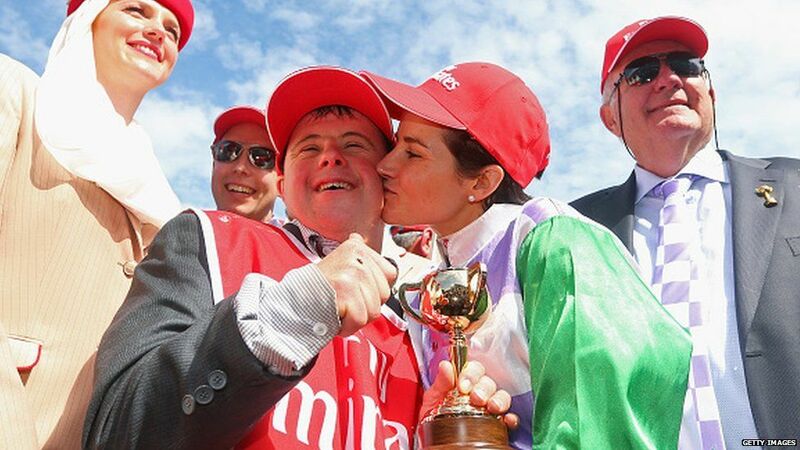 Champion jockey Frankie Dettori finished second, riding a horse called Max Dynamite. When she was 18, Michelle was thrown from her horse. She fractured her skull and suffered bruising to her brain. She had no short-term memory for two months and even broke her wrist during recovery. 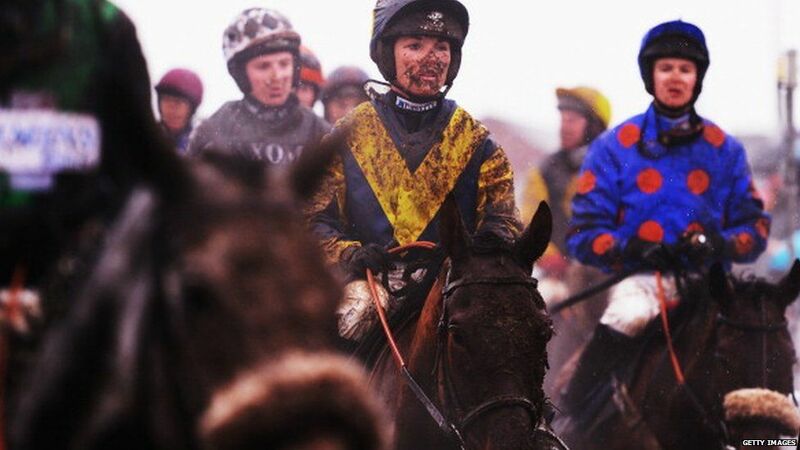 After winning she said: “It’s such a chauvinistic sport, a lot of the owners wanted to kick me off. Equality in horse racing is an issue in the UK too. Michael Tebbutt, a coach at the British Racing School, once apologised for comments he made about the strength of women jockeys. 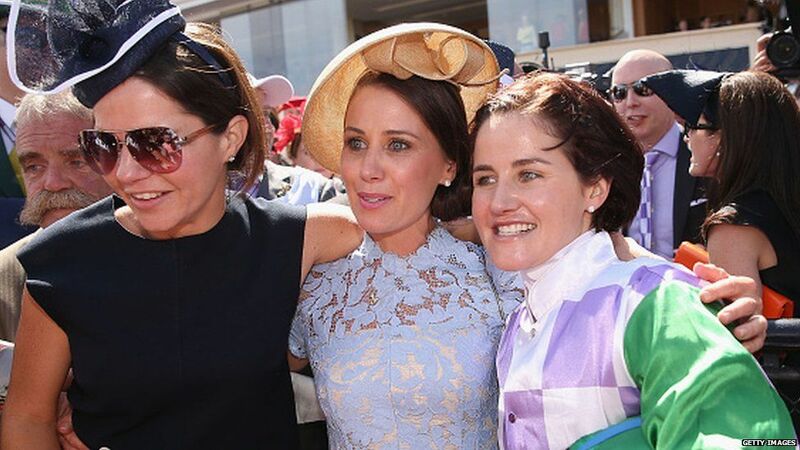 The closest a female jockey has come to winning the Aintree Grand National was in 2012 when Katie Walsh managed to finish third on Seabass. 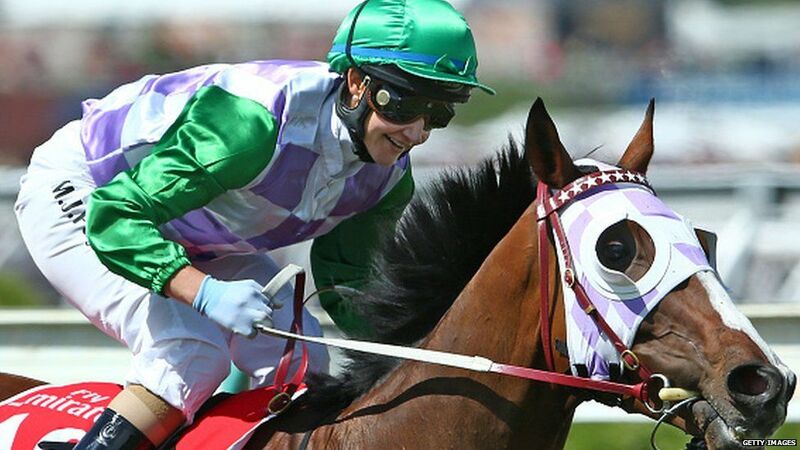 There were no female jockeys in the 2014 Epsom derby. 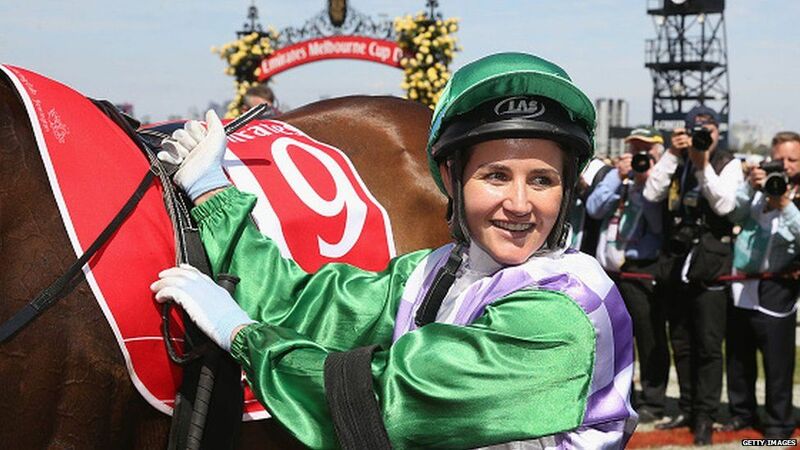 It is likely to be coincidence, but as some have pointed out, it seems fitting that she raced in purple, white, and green, the colours of the suffragettes. The Women’s Social and Political Union, whose members were called the suffragettes, used the colours. Purple symbolised dignity, white was for purity, and green represented hope. 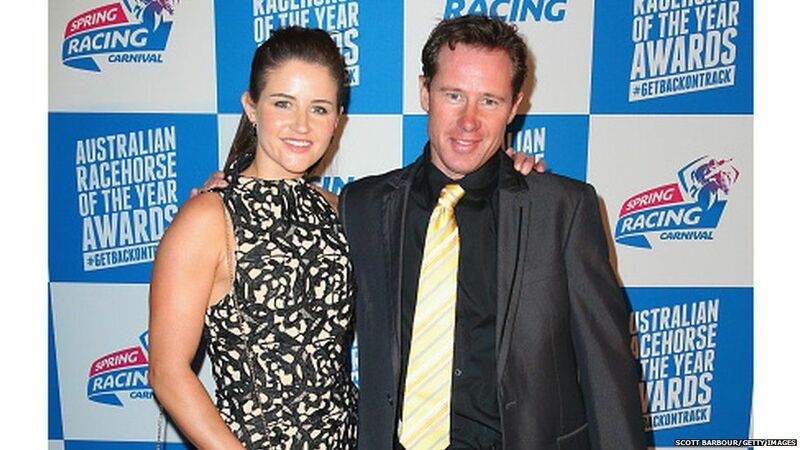 Stevie Payne is Michelle’s strapper, working in Prince of Penzance’s stables. He looks after her racehorse, grooming him as well as helping saddle up for races. He also has Down’s syndrome. Michelle said it was great he had been able to share the experience with her. Aside from her brother she has eight other siblings. Eight out of the 10 of children have become jockeys. Her mum died in a car accident when she was six months old and she was raised by her father. Prince of Penzance, cost just $50,000 (£25,000). His owners will take home almost $3.6m (£1.7m) in prize money.